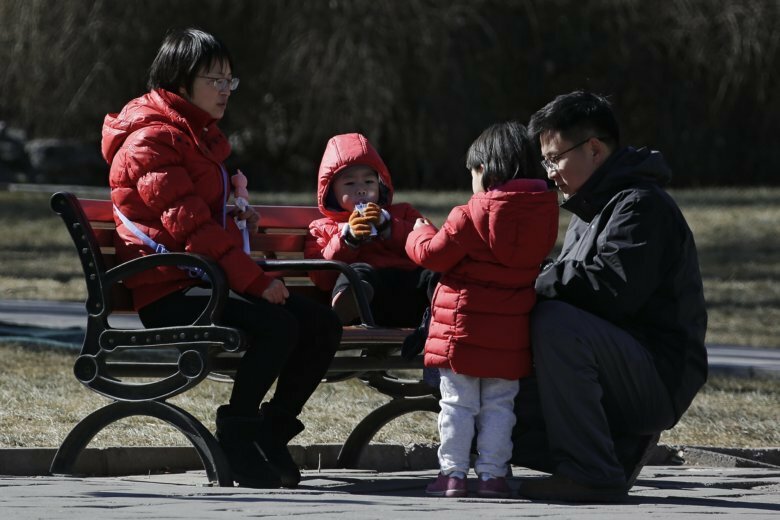 BEIJING (AP) — Facing a future demographic crisis and aging society, China’s leaders are desperately seeking to persuade couples to have more children. But bureaucrats don’t seem to have gotten the message, fining a couple in a recent widely publicized case for having a third child against the strict letter of the law. “The country is doing all it can to encourage childbirth but the local governments need money, so we end with this sort of madness,” a columnist and political commentator who writes under the name Lianpeng said on China’s Weibo microblogging service. The Wangs, the couple at the heart of the recent controversy, were ordered by local authorities in Shandong province to pay a fine known as a “social maintenance fee” of 64,626 yuan ($9,500) immediately after the birth of their third child in January 2017. After various deadlines came and went, the family’s entire bank savings of 22,957 yuan ($3,400) were frozen last month, with the balance still due. “I just don’t know what I’m going to do,” the husband, Wang Baohua, was quoted as saying by local media last week. The situation the couple faces has its roots in decades-old fears that China’s population would outstrip its resources, along with the ruling Communist Party’s all-consuming fervor to control people’s most personal decisions. Family planning regulations emerged in the 1970s, and in 1980 the notorious “one-child policy” came into effect, mandating often brutal punishments for violators ranging from forced abortions and sterilizations to fines and workplace demotions. Fast-forward 35 years, and a radical change of course was ordered after leaders realized an aging population and declining workforce threatened to hamstring the country’s future development. In 2016, the one-child policy was officially replaced with a two-child policy and Chinese couples were urged to go forth and multiply — within limits. But the bump in the birthrate was fleeting. Last month, the National Bureau of Statistics said the number of new births in 2018 fell to 15.23 million in a total population of 1.395 billion — a growth rate of .381 percent and the lowest increase since 1961, resulting in fully 2 million fewer births than in 2017. China’s population is estimated to peak at 1.442 billion in 2029 and then gradually decline, potentially fulfilling the conventional wisdom that China will grow old before it grows rich. Cases such as the Wangs’ remain common, despite a growing recognition of the seriousness of the population crisis, said Yi Fuxian, a professor at the University of Wisconsin Madison and a leading critic of Chinese population policies. Bureaucratic inertia and the desire of local officials to chase revenue contribute to the problem, Yi said. China, with an estimated fertility rate of 1.02 in 2018, now finds itself in the same category as other predominantly Chinese societies in Taiwan, Hong Kong, Macao and Singapore, Yi said. Average fertility rates in those regions and countries from 2005 to 2017 were 1.10, 1.12, 1.08 and 1.23 respectively. Yet the one-child policy has weighed down China with the additional burden of distorted attitudes toward the family, society and childbearing, where one or no children have become the norm, Yi said. With economic growth the primary guarantor of continued Communist Party rule, the leadership is concerned. The sputtering economy grew at 6.6 percent last year, its slowest pace in three decades, fueling fears over the long-term trend of a shrinking pool of workers paying the pensions and health care costs for a ballooning population of retirees. Despite that, there remains considerable resistance to lifting controls entirely, something that might give people greater autonomy. Local bureaucrats in the Wang case said they were just following the law, citing the exact articles and passages. They also have a strong stake in maintaining the rules that justify their jobs and authority. State media reports say fees meant to compensate for the resources extra children consume actually constitute a large percentage of local governments’ discretionary funding — 15-30 percent — and can be used for a range of purposes from salaries to travel expenses. Even if legal changes do go through, experience in recent years shows that’s no guarantee of more children. Families complain of the soaring costs of housing, education, health care and safe food, an important consideration given China’s frequent scandals over food and drug safety. And many young Chinese who are enjoying activities such as foreign travel are simply putting off marriage and childbirth indefinitely. “Other things have taken the place of children, like apartments and vacations. My parents put pressure on us, but I just say it’s not possible right now,” said a government employee who asked to be identified only as Linda. Boosting fertility will also require reforms to the economy, society and educational system, Yi said in an email.